I have a 35 year old cedar shiplap (tongue and grove) siding... fairly worn stuff. My painter is reccommending the 200 series over the 1500 series. The 200 series will work on Shiplap, right? The product says that it is for shake and shingle but I assume it will work on any type of cedar well. Thanks. I have a hem/fir log cabin like novelty siding. It has been stained with Olympic Cedartone 4 years ago and is starting to fade. What TWP stain would be appropriate to stain over this? What cedar tone like stain is the lightest color? You should not apply TWP over top of an older and different stain. Best to prep first to remove the old stain and brighten the wood when done. You can use the 200 Series or the 1500 Series for this. Hello - I am in Michigan and had a cedar fence installed in June - a few areas have begun to gray slightly, but for the most part I like the more natural color shade and do not want to hide the rough wood grains - which stain would be best to give me a slight tint without having a painted or solid-stain appearance? Right now I'm leaning towards TWP200 or 203 - will that be my best bet to add a little bit of color without masking the natural look of the fence? 200 Series is for cedar shake siding and roofs. You would want the 100 Series. None of the TWP products will give a solid or painted look. The lightest tint/color in the 100 series is the 115 Honeytone. Hello, please help. I recently received 2 estimates for a deck stain. The first guy said he would use 2 coats of TWP 100. The next person said that he would use a single coat of TWP 201. When I asked about the difference, he told me that the 201 was just a commercial grade product. I went with the second guy and today my deck was stained with 201. After reading the PDS for 200, I see that the product is intended for shakes / shingles. I am especially concerned about the statement that "the system is designed for non-traffic surfaces"
Do I have anything to be concerned about since the 201 was applied to a surface that it wasn't intended? Do you have any info on using this product on decks? You will be fine but it may take a while to fully cure and dry. 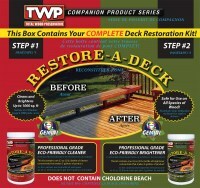 I have previously purchased TWP 206 Russet Brown stain for my cedar deck pergola, railings, and support beams. This color is not currently shown on your weg site. Has it heen discontinued? If so, what TWP product would be a good substitute? Looks at the 1516 Rustic as we do not carry the 206 Russet Brown. No you cannot add tint to darken the clear. Might want to clean off the prints then use the clear as is. The 1501 Cedartone is the same color as the 501 Cedartone that is not longer available. I had my fence and deck stained with TWP207 butternut brown. I need one gallon for staining a play set. What product and color should I use for a playset to,get as close to butternut brown as possible? is the series 200 available in the 1 gallon size? if so how much? also, do any stores out there carry your product? thanks! We do not sell it in one gallons. 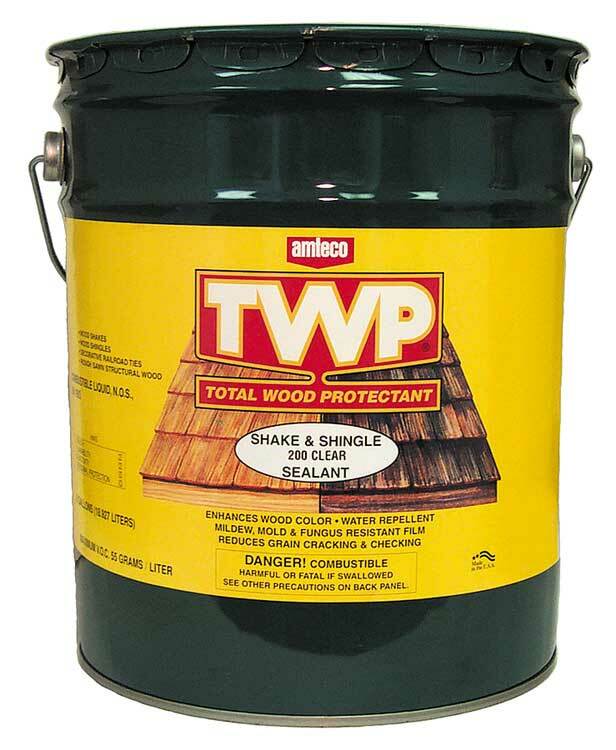 Does TWP have a solid stain product? Soes TWP have a solid coat stain product? Is the 200 stain product a solid or semi-tansparent stain. I need solid coverage for an older deck.